Common in pet fish and souvenir trade alike, the Chocolate chip star is quite well known to aquarists as well as to people not associated with the hobby. Nonetheless, much misinformation or misunderstanding exists with regard to this interesting and decorative (at least when alive) species. Its biology and successful aquarium care based on observations in nature and in captivity are summarized here. Chocolate chip sea stars inhabit mostly sandy to muddy lagoons and seagrass beds, they are more rare in reefs themselves and seem to prefer the back reef area. Typically they are found in rather shallow depths of 1-30 metres (3 to 100 feet), juveniles are most common in depths smaller than 2 m (7 feet). About 30 specimens are generally found in an area of 100 m? (1100 square feet) in their sea grass biotopes. This species occurs in many parts of the tropical IndoPacific: Eastern Africa including Madagascar, Sri Lanka, Indonesia, North to the Southern parts of Japan and South to the tropical Northern coast of Australia as well as some island groups of the Southern Pacific. Regionally it can be a very common sea star and is often collected, dried and sold as a souvenir. The Chocolate chips of Protoreaster nodosus can be rounded or pointed. 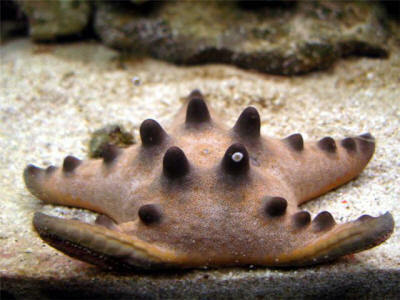 The Chocolate sea star was among the first animals to achieve a scientific name. It was named by Linne himself in 1758. An alternative common name often found in literature is ?horned sea star?. 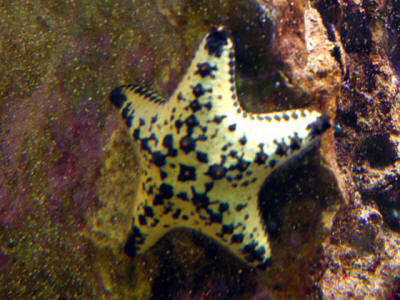 The chocolate chip star is part of the star fish family Oreasteridae. This family consists of rather stout species with thick, but short arms. Other members of the family like the sometimes traded Protoreaster linkii and Pentaceraster spp. 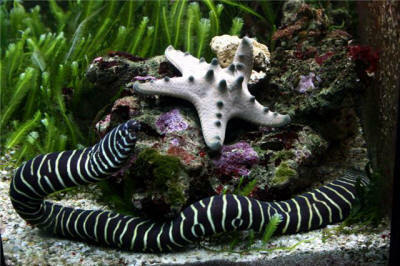 have needs quite similar to the Chocolate chip star, their aquarium care is comparable. 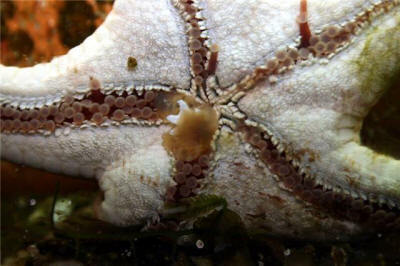 The eponymous chocolate chips or thorns found on the aboral (=not the side with the mouth) surface of Protoreaster nodosus are thought to deter at least some star fish predators from eating this species. Sadly, it is quite useless with regard to humans collecting and buying this species as a dried souvenir. 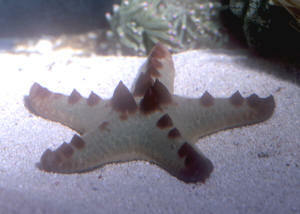 Other sea stars from the family Oreastidae require similar care as the Chocolate chip star. Following literature, the central disc can reach a diameter of up to 12 cm (5 inches) and the arms a length of about 14 cm (5.5 inches). Consequently the entire star can reach a diameter of up to 40 cm (16 inches). These maximum sizes are rarely reached in nature as well as captivity. Most Protoreaster nodosus do not grow larger than 20-25 cm (8-10 inches). Even specimens larger than 14 cm (5.5 inches) appear to be rare at the Philippines (perhaps due to collecting). In this area the mean diameter of adult specimens is 10 cm (4 inches), the mean weight is about 250 g (1/2 pound). The stars are a little larger at Palau with mean diameters of 14-16 cm (5.5-6.5 inches). Chocolate chip stars reach their adult stage (with working gonads) with a diameter of about 8 cm (3 inches). At this point they are about 2-3 years old. Typically sold specimens of about 10 cm (4 inches) are about 5 or 6 years old and specimens of 14 cm have an estimated age of 17 years. It appears to be unclear if the large specimens (40 cm or 16 inches) found in older literature are erroneous records, other species wrongly identified or simply very old stars with a good genetic basis, which grew up in biotopes with ideal food supply. The colours of the Chocolate chip star are quite variable, the background colour can be white, yellow, brown, red and even bluish. The ?Chocolate chips? are mostly grey to dark brown. The physiology of Protoreaster nodosus is in line with other well known sea stars. Food and waste enter and exit the same opening, the ?mouth?. Water is pumped into the vascular system by the madreporite, a small off-centred, wart like structure on the surface of the sea star. The madreporite supplies various canal systems in the star and is inevitable for locomotion as well as the functionality of the mouth. Air trapped inside this system can result in a sea star unable to move and consequently dying. Therefore, the stars should not be taken out of the water too suddenly, they need time to close the madreporite. If they leave the water by themselves, this is not a problem, because the vascular system will likely be closed already. In nature Chocolate chip stars can be found in the intertidal areas exposed to air and sunlight at low tide without being harmed. The madreporite, the sea star organ used for water exchange of the vascular system ist visible as a dark grey, oval spot. The vascular system of sea stars is filled with salt water. Due to the osmotic pressure, because of different salinities and temperatures at the pet shop and the home aquarium it is advised to acclimate sea stars slowly. The larger the difference in salinity and temperature, the slower the acclimation process should be. Half an hour to one hour are sufficient using drip acclimation in most cases. Most interestingly these stars seem to possess some kind of memory and apparently are able to be trained to be fed at a specific point at a specific time. Given their simple nervous system lacking a brain per se this is a tremendous effort. In the 1980s Chocolate chip stars were in the scope of the biochemical industry. Several interesting molecules like saponins, sterols and steroids have been found in them. This interest seems to have been discontinued in the last decades. Spawning takes place from March to May, the more shallow depths of their habitats are avoided during this time. Males are about as common as females and cannot be sexed externally. Synchronous spawning of the entire population happens at full moon and coincides with increasing water temperature and a decreasing salinity. It has happened in the aquarium, too. The eggs are about 200 um small. The larvae are planktotrophic (feeding in the plankton) and can be expected to be notoriously difficult to raise by the hobbyist. The floating larvae are found more close to the bottom than to the surface water, which is a quite unusual behaviour. They stay planktonic for 10-14 days until they settle to the ground and start a benthic life. Protoreaster nodosus larvae are spread in much smaller areas than other planktonic larvae. No report exists of this species with regard to reproduction by splitting as it is known from many other sea stars. Quite a number of hobbyists consider this sea star as hardy and easy to feed, although it is equally often stated that the success rates with this species are rather poor (e.g. Goemans, 2007). I believe this is highly dependant of the aquarium system and available foods. This species cannot squeeze into narrow gaps like Brittle stars, food items sinking into such crevices are lost for this species. 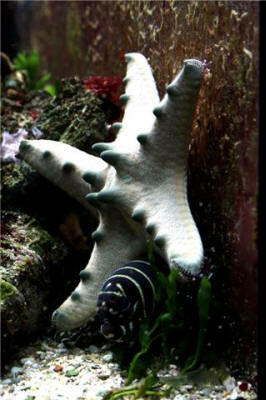 So, it mostly depends on the rockwork of the aquarium if the sea star is useful as a cleaner organism at all. In addition, it does not eat most types of nuisance algae and undesired bacterial films (Cyanobacteria). Chocolate chip stars eat by expelling their orange coloured stomach (to be more exact this is one of their two stomachs) and digesting their prey. Thus, it is quite easy to observe what they eat. Captive Chocolate chip stars are reported to consume sponges as well as other benthic sessile and vagile invertebrates such as soft corals, bivalves, slow snails, bryozoans, feather dusters, anemones, slow urchins, sea stars and even small fishes (if they can get them) as well as fish feces, carrion and sea grass. Interestingly, their natural diet was documented by more recent studies to consist mostly of meiobenthos (diversity of small benthic animals between 0.063 mm und 1 mm) and microbial/microalgal films (Scheibling & Metaxas, 2008). Consequently, it is well possible that the macroscopic foods these stars generally consume in captivity are ? at least in part ? just surrogate foods. Protoreaster nodosus consuming an algae wafer with its extended stomach. Consequently, Chocolate sea stars do best in systems with high water quality, but enough detritus and small benthos available. Tanks without skimmers or mechanical filters seem to be ideal, but are more difficult to keep in top condition with regard to water quality and can only be recommended to the advanced hobbyist. Deep sand beds commonly result in abundant benthic invertebrate life and, if well populated, will be a tremendous help with the nutrition of a Protoreaster. Over-cleaned stony coral reef systems do not resemble their natural environment and generally have too little adequate food to offer to a Protoreaster. Equally inadequate are fish only tanks with little surface to graze on, no benthic life and high nitrates. It's no real surprise that Chocolate Chip stars do best if their tank is similar to their natural environment. FOWLR systems with some macroalgae appear to be the best systems for Chocolate chip stars. As a minimum tank size for a 9 inch or smaller Chocolate chip star 50 gallons are recommended if pristine water can be guaranteed. For specimens growing beyond 10 and up to 16 inches larger tanks of at least 100 gallons, preferably more are needed. General water parameters recommended are a specific gravity of 1.022 ? 1.027 , a temperature of 22-27?C (72-81?F), a pH of 8.0-8.4 and nitrates << 20 ppm. My own approach to this species is a tank with live rock, a 4.5? well populated DSB, only a few medium sized fishes specialized on larger pieces of food (no grazers or plankton eaters) and various green and red macro algae instead of corals. The tank has no skimmer or mechanical filtration. The Protoreaster feeds mainly on biofilms in the tank (also at the water surface), small benthic invertebrates like tiny snails, worms, arthropods and leftovers from feeding the fishes (varied diet of various types of shrimps, pieces of various mussels, small pieces of fish filet). While this star has consumed soft and stony corals in the past, it did not eat several types of sponges and only partially digested a hydroid colony. It did not eat Aiptasia anemones, but consumed a Thalassianthus, which has a potent sting. The speed with which a wound from an tumbling rock accident in its former tank healed indicates that this systems seems to be sufficient. In addition, the star shows slow growth similar to what is found in nature. In tanks with mechanical filtration, skimming and more fishes the Chocolate chip star may need to be fed specifically (can be done by carefully placing the star onto a piece of food), because it may not find enough food or have to much competition by the fishes. This may work, but likely is less ideal, because the star will not be able to choose its diet from what is offered by the environment. Protoreaster spp. are able to recover from severe wounds given chemically and biologically pristine water quality as well as appropriate food, but they can fall prey to heterotrophic bacteria infecting small scratches in dirty water with high nitrate concentrations and bacteria counts. Sea stars can be severely hurt by triggers, puffers, parrot and box fishes. Not every specimen of these groups is a sea star predator, this mostly depends on the experiences and character of the fish specimen in question. Other sea star predators include shrimps from the family Hymenoceridae like the often traded Harlequin shrimp (Hymenocera picta and H. elegans). Last but not least it has to be noted that larger sea stars can be cannibalistic. 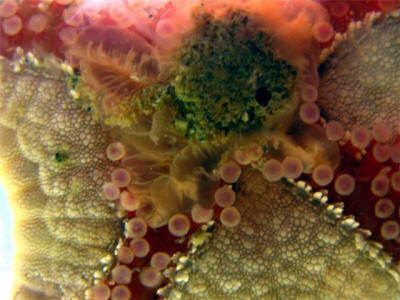 Protoreaster nodosus can consume sea stars of the same or other species. Here the prey is a small Asterina sp. star. In nature Protoreaster nodosus are often found accompanied by the glass shrimp Periclimenes soror, which live on the sea star and adapt to its colouration. Although this co-existence or even possible symbiosis might be a highly interesting subject to study in the adequate home aquarium, the stars are practically always imported without the Periclimenes, which are rarely found in trade, due to the collection process and because they would be eaten by many reef tank fishes. Other naturally commensal animals include Polychaete worms (?bristle worms?) living on the star without hurting it, but given common territoriality shown by aquarists towards bristle worms, I doubt they will have great survival rates in captivity. What about keeping Chocolate chip stars as a group? Protoreaster nodosus seem to restore their density in nature following experiments by placing more individuals into a given area. Therefore, it may not be wise to permanently overstock them the aquarium, because this will create a situation where the animals will be uncomfortable and always try to get a larger distance to each other. A Protoreaster nodosus will occupy an area of roughly 3 m? (33 square feet) in nature, which is much larger than what we can generally offer in the average home aquarium. Only a tank with a length of more than 3 metres (10 feet) and a width of more than 1 metre (3 feet) will be sufficient if one wants to duplicate the natural habitat with more than one star. In an adequate tank the Chocolate chip star can be a hardy as well as decorative pet, a much more delightful sight compared to dried conspecifics on the bookshelf. Erhardt, H. & Moosleitner, H. (1997): Meerwasser Atlas, volume 3, 1328 p. (in German). Goemans, B. (2007): Marine invert of the month ? Protoreaster nodosus (Linnaeus, 1758).- TFH, 56(1) September 2007, p. 76. Bos, A.R. ; Gumanao, G.S. ; Alipoyo, J.C.E. ; Cardona, L.T. (2008): Population dynamics, reproduction and growth of the Indo-Pacific horned sea star, Protoreaster nodosus (Echinodermata; Asteroidea).- Marine Biology, 156(1), p. 55-63. Scheibling, R.E. & Metaxas, A. (2008): Abundance, spatial distribution, and size structure of the sea star Protoreaster nodosus in Palau, with notes on feeding and reproduction.- Bulletin of Marine Science, 82(2), 221-235. Riccio, R.; Zollo, F.; Finamore, E.; Minale, L.; Laurent, D.; Bargibant, G.; Pusset, J. (1985): Starfish saponins 19. A novel steroidal glycoside sulfate from the starfishes Protoreaster nodosus and Pentaceraster alveolatus.- Journal of Natural Products (Lloydia), 48(2), p. 266-272. Crandall, E.D. ; Jones, M.E. ; Munoz, M.M. ; Akinronbi, B.; Erdmann, M.V. ; Barber, P.H. (2008): Comparative phylogeography of two seastars and their ectosymbionts within the Coral Triangle.- Molecular Ecology. 17(24), p. 5276-5290. Hartmann-Schrer, G. (1984): 2 new commensal polychaeta of the genus Hololepidella polynoidae from the Philippines.- Mitteilungen aus dem Hamburgischen Zoologischen Museum und Institut, 81, p. 63-70.